Do you tend to avoid shaving in fear of the reaction your skin will have? Do you take extreme precautions while shaving, yet still experience discomfort from razor burn and ingrown hairs? If so, Kallgren Dermatology Clinic has made a list of three easy ways to make your next shave easy and painfree. 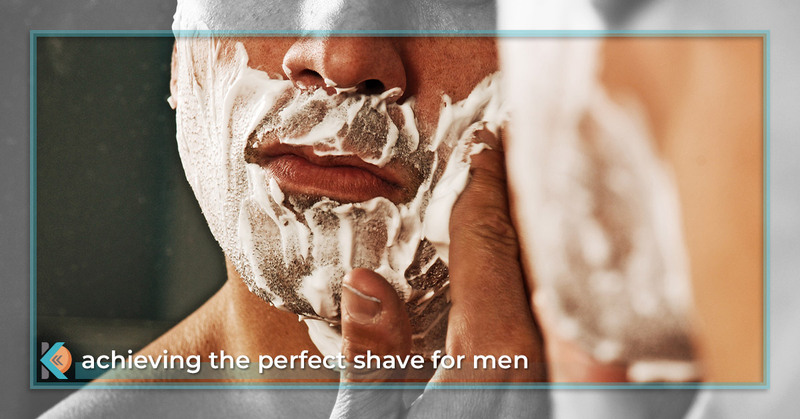 If you’d like to improve the health of your skin and never experience a bad shave again, read more below on how to achieve the perfect shave every time. Before you begin shaving, wet a hand towel or washcloth with hot water. Wring out the excess water, leaving just the hot towel, and gently set it on your face. Let the damp cloth rest on your face for one to two minutes before removing. The process of introducing steam to the skin will not only open your pores, but it will also significantly soften your facial hair, making it easier to pass through with a razor. For this reason, it is also advisable to shave after showering, rather than before showering. Using a steam towel on your face before shaving is crucial to ensure that your shave is gentle and free of irritation. For most people with sensitive skin, normal shaving cream just won’t cut it. Even when shaving with absolute caution, using shaving cream can still make you victim to razor burn, rash-like breakouts, and ingrown hairs. With the proper pre-shave product, however, razor burn will be kept at a bare minimum. Consider finding a pre-shave oil, or better yet a pre-shave gel, to apply to your skin before shaving. By using an oil or gel, you effectively create a slick barrier between your skin and the blade to deter ingrown hairs and irritated skin. The latest and greatest multi-blade razors often leave people with sensitive skin less than satisfied. In fact, multi-blade razors can significantly increase the chance of ingrown hairs and severe razor burn. If you’ve recently tried a fancy name brand razor, only to be left shuddering in pain, look into shaving with a safety razor. Safety razors are similar to straight razors in that they only utilize a single blade. When you shave with a multi-blade razor, you essentially make three to four passes on your skin in a single swipe of the blade. Multi-blade razors also cut the hair below the skin, making you much more prone to ingrown hairs and razor burn. Safety razors, however, achieve an extremely close shave while leaving a miniscule amount of hair above the skin so that ingrown hairs rarely occur. If you have any questions, or would simply like to learn more about the health of your skin, schedule an appointment with Kallgren Dermatology Clinic today. Our friendly staff is here to assist you in finding an appointment time that fits your daily schedule, so that you can be one step closer to restoring your beautiful skin.